Summer is upon us and with it come the sweltering heat and the burning sun. Every time you step out of the comfort of your home, you end up cursing the heat and the damage it is causing on your skin. While it is not possible to stay indoors all the time to prevent sun damage, there are steps that you can take to minimize the extent to which the summer affects your skin. We list here some summer skin care tips that will help you protect your skin and keep it glowing all through the season. Why should you change your skin care regime in summer? Summer is a season when the sebum production in your skin increases and your skin becomes oily and dull. Add to it the damage caused by the sun and what you have is extremely tired skin. The change in the season calls for products that give you UV protection, are light on the skin and products that can remove excess oil from your skin. So what all does summer skin care entail? Lets take a look. Change to a face wash that helps you control the amount of oil on the skin. Look for ingredients like salicylic acid, lemon, peppermint, tea tree oil, neem and cloves which will regulate the amount of sebum that is produced by the skin and also prevent any bacterial infection that can lead to acne. Wash your face at least twice a day to keep off excess oil from the skin. It is important to exfoliate your skin at least twice a week during summer. If you have excessively oily skin, then you might want to consider using a mild daily exfoliating scrub like this. A scrub will help you get rid of all the accumulated dead cells and sebum on the skin and reveal smoother fresh looking skin underneath. Once a week, treat your skin to nourishing and hydrating face packs that will cool your skin and restore that lost glow. You can use fruits, fuller’s earth, milk or honey to pamper your skin. Look here for ideas for summer face packs. Because the winter is behind you, it does not mean you should skip the moisturizer. Summer is a season when your skin needs to be hydrated. So opt for lightweight non-comedogenic moisturizers, preferably gel based. They will keep your skin hydrated and supple without making it too oily. If you do not know which moisturizer to pick, simply go in for a moisturizer that is made for oily skin. We cannot stress enough on the importance of sunscreen during summer. 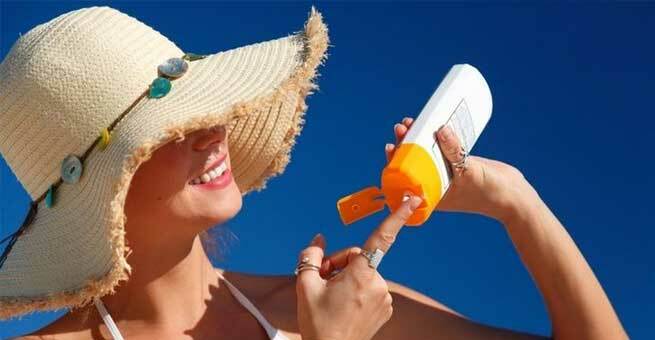 It will not just prevent tanning, but also protect you from cancer causing UVA rays. Always slather on sunscreen all over the exposed parts of the body twenty minutes before you step out in the sun. Reapply after 3-4 hours depending on the SPF levels in the sunscreen, your complexion and the amount of heat outside. We know that it is hot out there and you would rather remain cool in your strappy top and shorts. But if you are going to remain outdoors for too long, then we suggest you wear protective clothing to shelter your skin from the sun. Wear long sleeved clothes and full pants that are not too tight. Stick to light colored breathable cotton clothing during summer to keep yourself cool. It is time to pull out that wide brimmed hat and those big sunglasses if you want to get maximum sun protection this summer. Invest in a good pair of glares that protect you from UV rays. If wearing hats is not your style, then pick a fancy scarf to cover your head and your face to shelter them from the harsh rays of the sun. If you want your skin to glow, then make sure you are feeding your body enough water and lots of fresh fruits and vegetables. Stay off heavy fried foods this summer and include lots of fruits, juices, salads and fresh veggies in your diet. The more water and fiber you consume, the better your skin will be. Avoid too much caffeine and take to green tea instead.